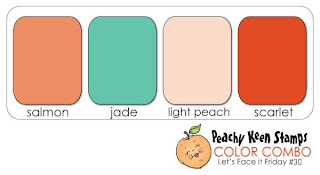 The Peachy Keen Let's Face it Friday challenge this week is a color combo challenge. I really like these colors together. The equivalent Stampin' Up! colors for this challenge are Blushing Bride, Pool Party, Pink Pirouette & Poppy Parade. 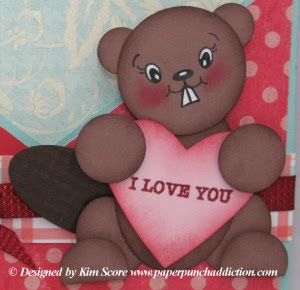 These are great colors for a Valentines card, so I made a little Bucky Beaver punch art character and stamped his face with the PK-754 Critter Faces Medium face set. Check out the other great projects at the Challenge blog HERE. This is a Criss-Cross card style. 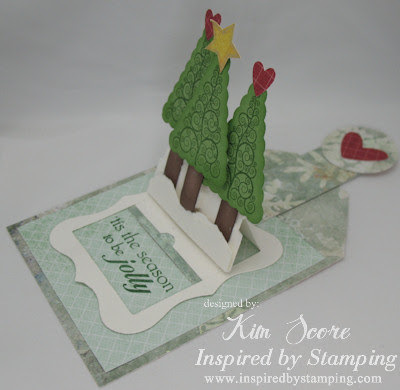 You can get the step by step tutorial at Splitcoast Stampers HERE. The papers are a combination of Stampin' Up!, DCWV and My Minds Eye. See the step by step instructions for Bucky Beaver below. Score a small piece of Early Espresso every 1/8", turn and score every 1/8" to create a cross hatch design. Punch a Large Oval out for the tail. 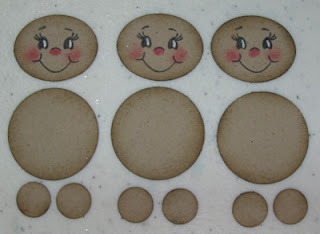 Stamp the face onto 1-3/8" Circle with PK-754 Critter Faces Medium face set. Add highlights to face with uni-ball white gel pen. Stipple regal rose ink onto cheeks (I love the PKS brushes HERE). Stamp greeting on heart (PK-281 Valentine Cupids) with Cherry Cobbler ink. Sponge edges of heart with cherry cobbler ink. Sponge the edges of close to cocoa pieces with chocolate chip ink. Clip the bottom off two 3/4" circles for feet. Glue ears onto head. Attach head to body with dimensionals. Glue legs onto back of body. Attach feet with dimensionals. Glue tail onto back of body. Attach heart to front with dimensional and attach paws with dimensionals. Peachy Keen has a great sale going on until the end of the month. Stock up now! Save 10% throughout December 2011 on orders 25.00 and over. SAVE an additional 10% off of the same order with promo code DEC10 through December 31st! 99 cent shipping in the USA on the same order too, through December 31st! I don't think I ever shared this project on my blog. 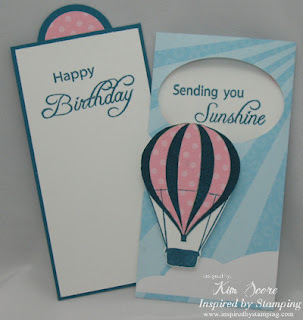 I created this card for my T-Slide tutorial on Splitcoast Stampers. You can find the step by step to create the bird on my blog HERE. The T-Slide tutorial is located HERE. The new year is coming up on us. How about a great gift idea for the new year? I posted this tutorial on my blog last year. Some of you that haven't seen it may want to check it out. There is a great design for each month of the year of these sweet bears. Please note that the face in the tutorial uses the old Stampin' Up! small oval. If you don't have this oval, you can easily use the current small oval in the catalog and they will look just as cute! 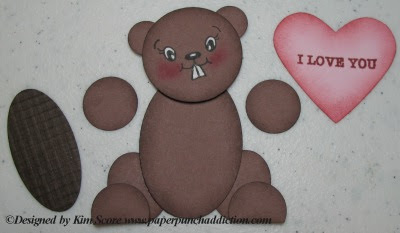 Looking for some fun Valentines projects? I have two tutorials that you will love. Please note, THESE ARE NOT NEW TUTORIALS. Please make sure you don't already have them before ordering. Thanks! For those of you that celebrate, I wish you all a very merry Christmas. I hope everyone has friends/family to spend this wonderful day with. This year, my daughter got all the toys she wished for. My heart goes out to those that could not afford to celebrate the holidays. I wanted to share a couple heart warming stories for the holidays. 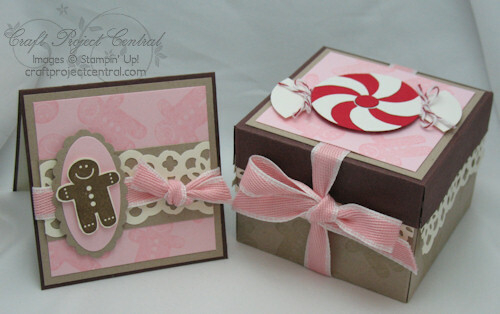 In case you missed it, Craft Project Central is offering a FREE tutorial for a holiday gift. Check it out HERE. Good morning, everyone! I have a tip to share for viewing these foreign sites I share on occasion. Use the Google Chrome web browser (which is far superior to Internet Explorer!) and in the options, activate automatic page translation. It's nice to go to a foreign language site and have it automatically show up in English. 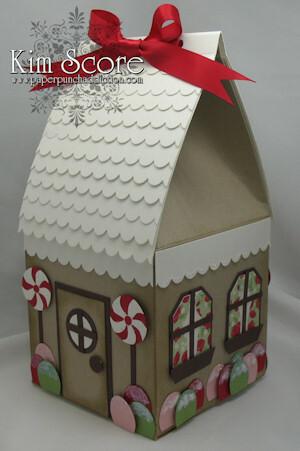 This gingerbread treat box and card is my contribution to Craft Project Central this month. The box is the perfect size to hold up to 10 Ghirardelli chocolate squares. This makes a perfect stocking stuffer, teacher gift or secret santa treat! 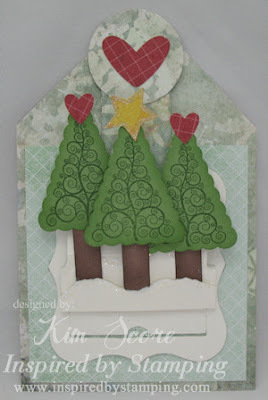 For the full instructions, sign up for December at Craft Project Central for only $10. Today is the big day! 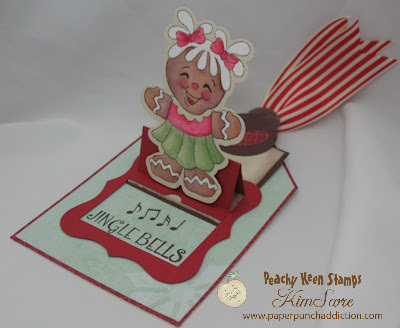 Please hop on over to Inspired by Stamping to check out the new set! This set is so easy to paper piece with. You will get an awesome look by stamping onto designer papers instead of coloring. Try mixing it up by stamping on several different color papers and then combining on an image that is stamped with black. Stamps: Inspired by Stamping "The Sky's the Limit"
In case you missed it, check out my other 2 projects. The challenge this week for Let's Face it Friday is to use fabric somewhere in our design. I cheated a little and put fabric on the outside of the card on the belly band. I've been waiting to share this pop up stage card for just the right time. 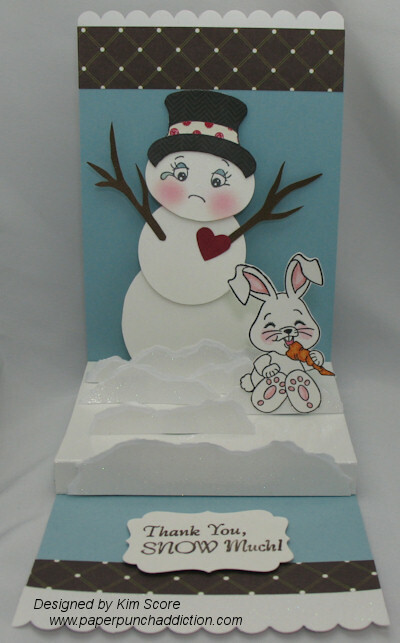 I used the PK-333 Snowmany Thanks Snowman and Bunny for the bunny, paper pieced hat and greeting. For the face, I used PK-451 Wide Eyed Kids 1-1/8". See below for the instructions to make this card. For more great projects, check out the challenge site HERE. Play along on the challenge for a chance to win a great Peachy Keen prize! Create the pop up stage card using the pop up stage tutorial HERE. The tutorial shows the card in landscape view, however, this card can be adapted to a portrait view by cutting the card base 4-1/4" x 11" and folding in half. Cut the stage piece 4-1/4" x 5" (score at 1/2", 4, 4-1/2" on long side). The rest of the pieces and assembly is the same. 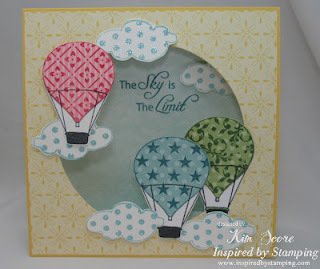 Day 2 of the Inspired by Stamping Sneek Peek is here. More fantastic projects are waiting at the design team member's blogs. I created a tent card which is perfect with this set. The basic tutorial for a tent card is located in the resource section at Splitcoast Stampers. Today is the first Sneak Peek day for the Inspired by Stamping The Sky's the Limit stamp release party that will take place this Saturday. Please join me for the next 3 days to see the Design Team projects featuring this new set! It has been quite a while since I've made a T-slide card. This fantastic set is just perfect for it! 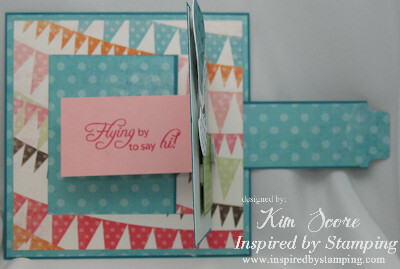 For step by step instructions on how to make a T-Slide card, please check out my tutorial HERE. Please hop along to the other design team blogs. They all have beautiful ideas to share for this set! Leave a comment at each stop for a chance to win the set in a drawing! Calling all blog owners! 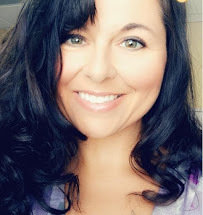 Hi all, in an effort to make my life a whole lot easier, I would love to add to my current blog reader. If you have been featured in the past on my daily inspiration, then no need to respond, as I already have you on my radar. But, if you are a regular reader here and have not been featured, I would love to check out your blog! I am always looking for quality blogs that feature beautiful projects on a regular basis. This makes it much easier for me to find my daily inspiration. Please leave a comment here with your blog address. (please note my comments are moderated, so please wait for it to show up) I'll be checking you out soon! * An active blog that you've maintained for a minimum of 6 months"
• Upload your Peachy Keen Stamps' creations to the NING site, the PK Connection. 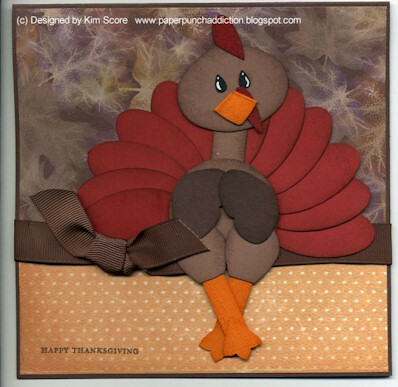 • From time to time, they will ask for volunteer Designers to create projects for participation in cross-promotion of Peachy Keen Stamps and other papercrafting companies' blog hops and giveaways. This is optional and in addition to any other projects on the blog. 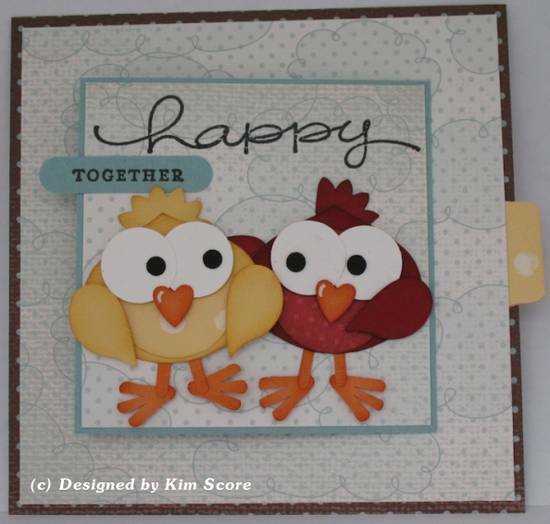 • Encourage fans of Peachy Keen Stamps to participate in the challenges and view the blog by promoting the links on Facebook, Twitter, your blog, and any other outlet you choose. Social Networking plays an important role in marketing efforts, so they ask that if you have a Facebook account or Twitter account, that you help spread the word about PKS stamps. 2. Your creative resume, if applicable. 3. Photos or links to 3-5 favorite stamped projects you've created. Peachy projects are great, but not required! 4. Any current DT's you are on or have been on. It is absolutely ok if you are on another DT, we just want to be sure everyone can commit to the DT requirements we have set up. 5. Why you think you think you'd be a great fit for PKS! This call is open to ALL paper crafters - we'd love to see what you've created! Please let us know any and all electronic cutting software you are familiar with and have access to (if applicable). This call will remain open until December 23rd - 11:59 pm CST. Sorry I didn't get this posted in the morning. December is going to be an incredibly busy time for me. I have a lot of projects to complete for the several design teams I work on. I know that other bloggers will probably be busy with holiday planning and spending less time on blogging. Consequently, there probably won't be as many quality projects to share with you and I don't have hours to spend combing the net for them. My daily inspiration posts will probably not happen on a daily basis because of this. I will try my best but you may have to check back every other day to see what's new on the inspiration post. The good news is that with all of these projects coming up, I'll have lots more creations of my own to share! So, please keep coming back often to see what's new! I posted my Gingerbread House treat box earlier today HERE. I thought it would be nice to make a cute little card to go along with the box. Since we postponed the Peachy Keen Let's Face it Friday challenge to December 8th, I wanted to share this baby gingerbread card with all of my readers. I've always loved the sweet little faces from the Peachy Keen Snow Cuties set. It's such a versatile set for snowmen, gingers and people. I used the assortment size set HERE because I needed the smaller 3/4" size stamps for the faces. Additionally, I used the new Oh by golly! greeting set. 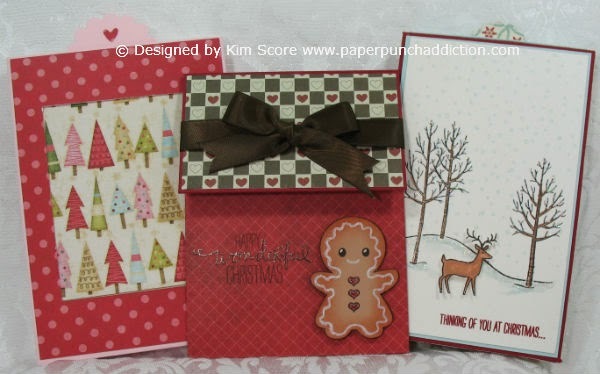 The greetings in this set are perfect for all of your cute and whimsical projects! 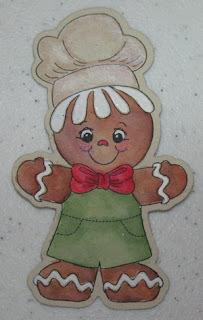 See the tutorial below for my baby gingers card. PEACHY KEEN HUGE SALE ANNOUNCEMENT! Face Assortment Bundle featuring 2 of my all time favorite sets! Winter Face Bundle featuring my current favorite face set! Face Part Bundle featuring the most versatile stamps for every day! Do you already have these sets? No problem, they are offering 25% off all other stamps! Check out my top 10 face sets list HERE. You don't want to miss this sale! Stock up now on the best sets to make your punch art come to life! Stamp the Snow Cuties 3/4" faces on small ovals with black ink. Add white hilights to eyes with uniball white gel pen. Stipple regal rose ink onto cheeks (I suggest the brushes HERE). Apply regal rose ink to nose with blender pen or brush. Sponge edges of ginger pieces with Soft Suede ink. For the card, cut 4" x 8" piece of Real Red card stock and fold in half. Cut piece of Holly Berry Bouquet designer series paper 3-7/8" x 2-1/2". 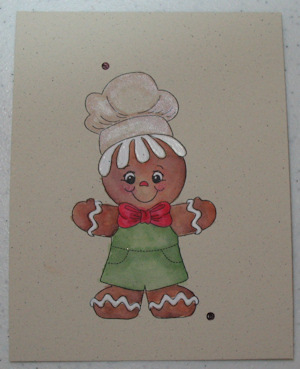 Cut piece of 4" x 1-1/2" Chocolate Chip card stock. Emboss with Square Lattice embossing folder. Trim the length of piece down to 3-7/8" (I suggest embossing before cutting since the paper shrinks a little when it's embossed). Mount designer paper onto card base, aligning left, right and top borders equally. Glue body pieces of gingers along bottom of designer series paper. Mount chocolate chip piece, aligning left, right and bottom borders equally (it will overlap bottom of ginger bodies). 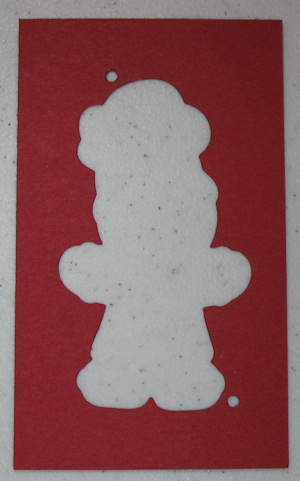 Cut a piece of red glimmer paper 1/2" x 3-7/8" and mount over the seams of DSP and chocolate chip card stock. Attach ginger hands and heads with dimensionals. Cut piece of real red card stock 1" x 3" and corner round edges. 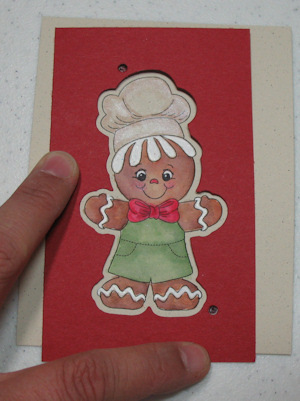 Cut piece of crumb cake card stock 7/8" x 2-7/8" and corner round edges. Sponge edges of crumb cake with soft suede ink. Stamp greeting from Oh by golly! stamp set with red red ink. Layer onto real red piece and attach greeting to top center of card. Punch small heart in real red and attach with dimensional. Looking for some super cute ideas for treat packaging for the holidays? Check out my Gingerbread House and Snowman treat containers HERE and HERE. Happy Thanksgiving to all of my readers that celebrate today! Some time today, many of us will be laying around in a turkey induced stupor after eating way too much. I myself am a crazy shopper and will be hitting Kohls at midnight. I shared this turkey a couple years ago but I thought I would share him again. If you haven't seen this and want to check out the tutorial, go HERE. I'm finally getting around to posting this. I created this when I was down in Green Bay spending some quality crafting time with my Peachy Keen sisters. I don't even pretend to be a copic expert, so I got a lesson from the copic queen, Lorie Souther. She showed me how to color the images and I showed her how to make a sliding pop up. 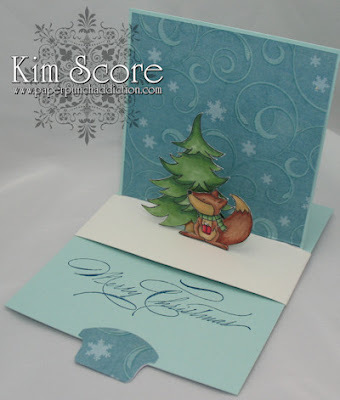 This sweet little fox is from a Stampin' Up! set called Forest Festivities. The greeting inside is another Stampin' Up! set called Hand Penned. Both sets are in the holiday mini and available through December. The pretty tree is from a Peachy Keen set called PK-231 Snowflakes. For the step by step tutorial on making a sliding pop up, please go HERE. Hey all, do you have any Peachy Keen face stamps? Play along on the current Let's Face it Friday challenge for a chance to win one of the new Kut Out dies with stamp combos (your choice). There aren't a lot of entries right now so you have a great chance of winning! (winner will be randomly drawn from all entries). Please go HERE to enter! Did you see my newest tutorial? 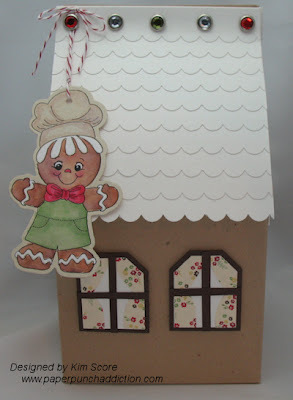 Check out my pop up gift tag tutorial HERE. As promised this morning, I'm sharing the tutorial to create a pop up gift tag as featured on THIS POST. 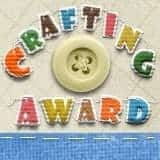 When I got my newest Sizzix die from Stampin' Up!, I knew right away what I wanted to do. The frames on the Bigz L Peekaboo Frames die is perfect for this technique. 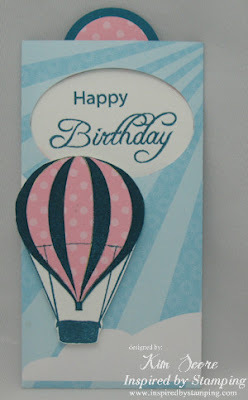 If you don't have the die, you can make a full size pop up card as instructed on Splitcoast Stampers HERE. 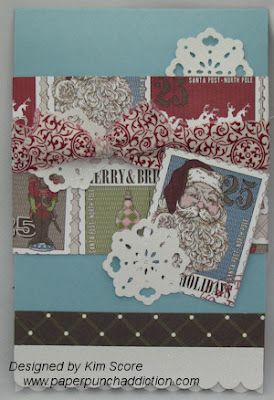 Once again, I got to use this beautiful set from Inspired by Stamping called Christmas Cheer. Check out all of Joanna's beautiful stamps HERE. 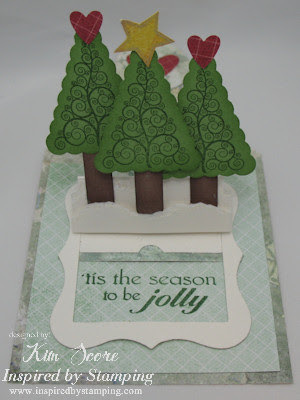 I discovered that the swirly tree fits perfectly inside the Pennant Punch from Stampin' Up! How cool is that? I'm excited to show you the newest, coolest products over at Peachy Keen! Do you dread cutting stuff out? Now you don't have to! Peachy Keen has come out with a new line of dies called Kut Outs that are used with a coordinating stamp set. There are several beautiful sets to choose from (dies and stamps come separate). 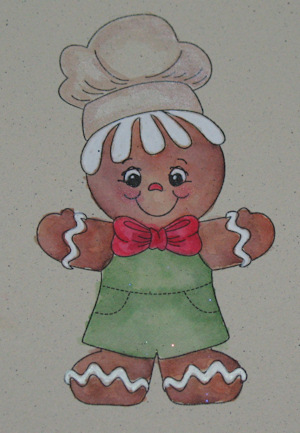 I got to play with the PKS-14 Gingerbread Boy and PKKO-02 Gingerbread Boy Die along with the PKS-02 Gingerbread Girl and PKKO-01 Gingerbread Girl Die. I also got this awesome new greeting set PKS-15 Oh by golly! These dies are so easy and fun to use! 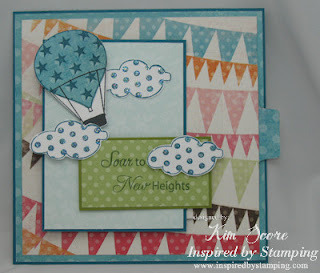 For a step by step tutorial on using the dies paired with the stamps, please scroll down below the blog hop list. BLOG CANDY ALERT! 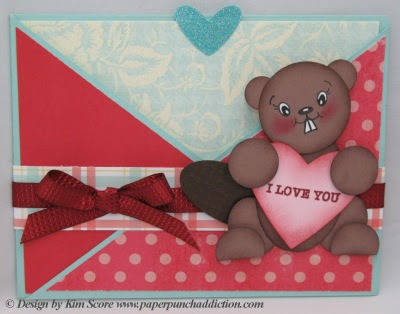 Leave comments on the hop stops for a chance to win a die and stamp set combo prize. 3 winners will be drawn from all comments left on the hop stops. The more places you comment, the better chance you have to win! Jump on over to Heidi's blog to check out her fantastic projects! Did you happen to start the hop here? Check out the other great stops on the hop. Step 1: Stamp and color coordinating Peachy Keen stamps on card stock. 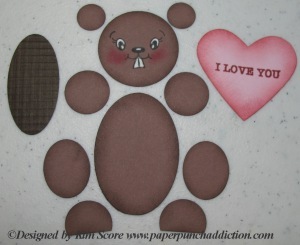 Step 2: Cut a piece of card stock 3-1/2" x 5" for a template. Center the die on card stock and cut with die cutting machine. With the Sizzix Big Shot, use the platform with all folders closed, clear plate, card stock, die cutting side down and other clear plate. Step 3: Lay the template over the stamped image and position so that there is an equal border all the way around stamped image. Step 4: Color in the little circles on template with pen or pencil. Set template aside (keep for future use). Step 5: Place stamped image on cutting platform and clear plate of Big Shot. Place Kut Outs die over top of image (cutting side down). 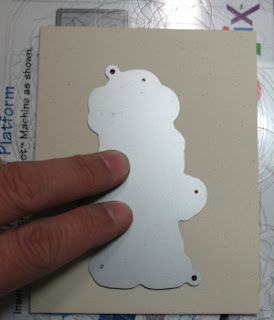 Align the marked circles on the card stock with the register holes on the die. Carefully place the clear plate of die cutter on top and run through Big Shot. Finished piece will have a perfect border all the way around!